Shot with 2 cameras, the Finals Pump Room was a mass of pumping, posing and sweating guys, all eager to get on stage. You get more of massive RONNIE COLEMAN than ever before as he pumps his incredible arms and back to the max! Shot with 2 cameras, the Finals Pump Room was a mass of pumping, posing and sweating guys, all eager to get on stage. You get more of massive RONNIE COLEMAN than ever before as he pumps his incredible arms and back to the max! He easily wins his 6th Olympia title with his “muscles on muscles”. 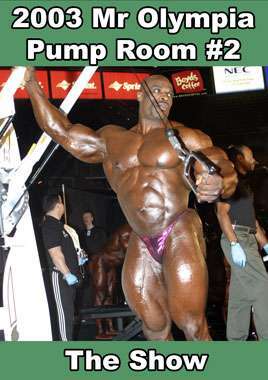 All competitors are shown and named as they pump, oil and pose.